Maryland firms placed in prominent positions in the 2016 Top 100 Firms and Regional Leaders ranking, recently released by Accounting Today. Aronson LLC of Rockville ranked #74, and SC&H Group of Sparks ranked #87 on the national top 100 list, based on total revenue. Seven firms saw over $1 billion in revenue each, and their rankings remained unchanged since last year; these firms were: #1 Deloitte, #2 PwC, #3 EY, #4 KPMG, #5 RSM, #6 Grant Thornton, #7 BDO. In national niche services rankings, SC&H Group ranked #4 in Management Advisory Services (MAS), among firms in the under $100 million size category. Ellin & Tucker of Baltimore ranked 12th among the fastest growing firms in the nation. Seven Maryland firms were listed among the sixteen ‘regional leader’ firms within the Capitol Region, stretching from Delaware to Maryland, Virginia, Washington, DC and West Virginia. These firms (and their related regional ranking) include: #2 Aronson, #4 SC&H Group, #10 Calibre CPA Group of Bethesda, #11 Ellin & Tucker, #14 Gelman, Rosenberg & Freedman of Bethesda, #15 Gross, Mendelsohn of Baltimore, and #16 Smith Elliott Kearns of Hagerstown. According to the AccountingToday report, attest services continued to rank #1 in practice growth – with 84% of firms (a total of 81 of the Top 100 firms responding) reporting growth in that function. Coming in a close second (and third) were Business Valuation services and State and Local Taxes (SALT), which tied at 80% of firms reporting growth in those areas. The growth in Business Valuation services in 2016 represented an 11% year-over-year increase vs. 2014, pushing BVS up 4 spots on the niche list. Estate/trust/gift/tax planning rose 13% compared to last year, with 78% of firms reporting growth in that area in 2015. International tax services rose 7%, with 78% of firms reporting growth in that area, and the top five niche services list was topped off with M&A falling a few spots, but still showing a 4% growth rate as shown by 78% of firms reporting growth in that area. 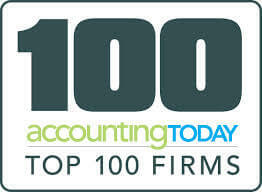 For further details (including 20 more niche growth areas), see AccountingToday’s Special Report: The Top 100 Firms and Regional Leaders – 2016.